For a really long time I have been contemplating making moisturisers and body butters at home. I have been exploring recipes on the internet, looking for simple non fussy ones that don’t require too much hard-work. Of course, I do intend to progress to the complicated recipes a bit later, but the easy peasy ones are just to garner the confidence. We’ve suddenly experienced a dip in the temperatures and I had exhausted the supply of the body cream for my boys. I wanted to use a body butter for them because I wanted something slightly heavy that kept their skin hydrated and nourished for a while and that was when I decided to try this recipe. I had a bottle of pure coconut oil lying at home and I decided that would be the base of the body butter. What you need is solid coconut oil. You need to follow the whipped body butter recipe or else it won’t turn out fluffy as shown in the pic above. The first time I used partially melted coconut oil and I spent 10 mins whipping the mixture but nothing happened. I kept the mix in the refrigerator for about an hour and when it was solid I started using the blender to whip it again. Half a cup of solid coconut oil. I let it harden in the refrigerator for about an hour. A few drops of essential oil – I used lavender. Yes, that is all that went into it. 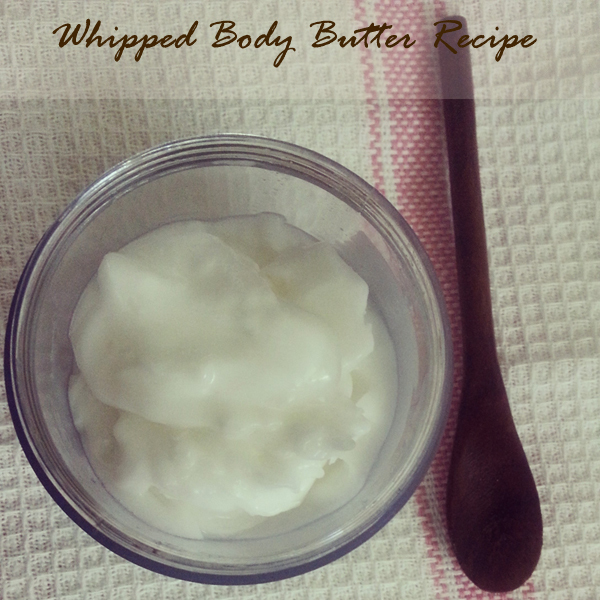 I have not used the vitamin E oil in the whipped body butter recipe, but I have found most recipes that do use it. A lot of them also use a bit of shea butter in it but I was looking for something really simple so I stuck to just the first and second ingredients. All that you need to do is combine the ingredients and whip it on high with the blender for about 10 minutes. I used about 100 ml of coconut oil. It starts getting nice and fluffy within about 6 minutes of the whipping. In 10 minutes, it gets this airy and a light texture. All you need to do is scoop it out into a jar you want to store this in. That is all you need to do. Isn’t it simple? Store this in an airtight jar. I need to store this in the refrigerator and take it out about 5 minutes before I want to use it. It also makes an excellent massage option for the boys. There is the goodness of coconut oil and the oils of lavender that is calming and relaxing. Pure coconut oil gets absorbed into your skin quickly and does not leave it looking oily and sticky. That is a big plus point. So I get to use this as a moisturiser as well as a massage oil for the boys. The cost of this came up to approximately INR 15 and I got a 100 gm jar of the body butter. The best part? I know what’s in it and it has a fragrance I love. This post inspired me to try out the whipped body butter recipe. The pic in the recipe I saw in the net shows it like a really thick whipped butter, but my recipe was fluffy enough but did not reach that consistency as you can see.